It's almost time for Halloween to hit theaters and David Gordon Green set aside some time to talk about working with horror legend John Carpenter on the film. Carpenter is back to the franchise as an executive producer on the new movie and is composing the score as well, which was teased earlier this week. Carpenter is taking some ambient pieces of music that he has created with his son Cody, and Daniel Davies along with different variations of the iconic Halloween theme to create something new. In a recent interview, David Gordon Green was asked about the experience of working with John Carpenter on Halloween. Green has been collaborating with Carpenter on the score, passing notes via Skype sessions, with the Halloween creator also trading notes about the film. Green, who still seems blown away that he gets to work with Carpenter, detailed their working relationship. He had this to say. "Oh, it's been really fun. We'll do a lot of weekly Skype sessions and he'll play some stuff and send tracks. It's cool, too. I'll watch the movie with him, and just get notes and ideas, so that's pretty incredible, and hilarious, as you could imagine. So, he'll be in his studio with his keyboard and a screen (watching) the scene, and I'll be on my computer, communicating through Skype, but watching him watch the movie, and get his ideas and commentary and musical suggestions. It's kind of cool. It's hard not to smile, you know. In many ways, this job is a dream come true. It's been an incredible collaboration, with an incredible cast and group of producers, and the icing on the cake is, I get to work with one of my idols in a musical capacity, which is such an unexpected delight." Horror fans were elated to learn that John Carpenter was coming on board to collaborate on Halloween. When originally asked about the project, Carpenter joked that it was for money, but as the production has gone on, it's clear that the horror icon is taking this very seriously. Both, David Gordon Green and co-writer Danny McBride, have talked about their excitement to have Carpenter involved to share his experiences and thoughts, shaping the film in an organic way. When asked about working on Halloween, John Carpenter said that the experience was "transforming." The composer/director/writer admits that he felt a lot more freedom to explore this time around because he did not direct the movie. He also notes that his Skype sessions with David Gordon Green helped him to get into the director's headspace and in the end, he says, "I was proud to serve David Gordon Green's vision." Carpenter has talked about the struggle to write the original Halloween sequel, so he must have been relieved to have someone else take on the heavy lifting, while he's left to create. The Halloween score comes out on October 19th, along with the movie and is available in a number of different vinyl and CD packages that are currently up for pre-order via Sacred Bones Records. 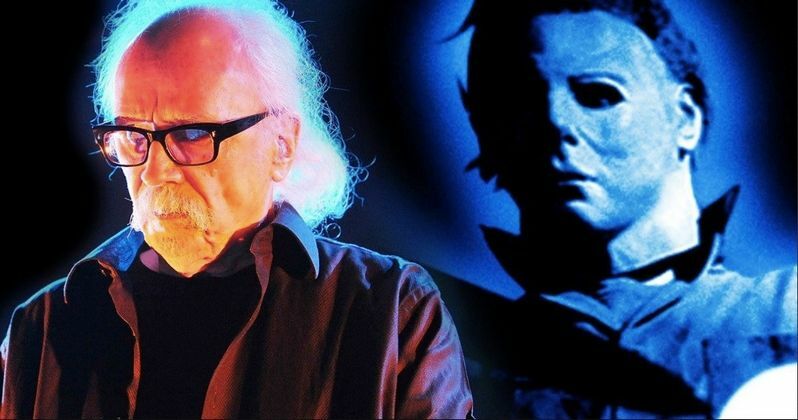 Just like David Gordon Green and Danny McBride have talked about bringing the franchise back to its roots, John Carpenter has dusted off many of the same instruments that he used in the original Halloween score for the new film to bring the same feeling. Fans can look forward to hearing the classic analog synthesizers that made the first movie so haunting in a new version of the franchise. The David Gordon Green interview was conducted by Entertainment Weekly.